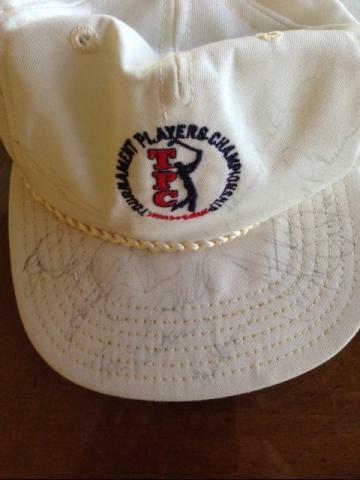 Tournament Players Championship logo cap signed by eight (8) legends of the PGA! 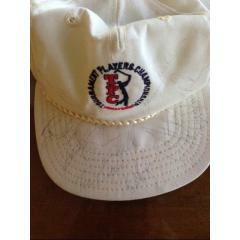 This is a very unique piece of sports memorabilia that any collector or golf fan would love for their own. The cap is signed in blue ink by PGA Hall of Fame members Arnold Palmer,Tom Watson, Ray Floyd, Sam Snead, Hubert Green, Johnny Miller and Lee Trevion - as well as long-time tour member and links legend Bill Rogers. The names on this cap represent some of the greatest golfers of all time and some of the most popular players to ever walk the fairways in this country and across the pond. The cap comes with a custom display case and Full Letter of Authenticity from James Spence Authentication. However, due to the singular nature of this offer we must charge your credit card for the full amount immediately upon taking your order. This policy ensures we reserve the cap for you. We will confirm your order by Email. This cap is not game worn. Please allow at least 2 weeks for delivery.